Morning Headache: Brain Tumor or Sleep Apnea? Waking up with morning headaches can mean a brain tumor or sleep apnea because when headaches are caused by these two conditions, they typically are present as the patient wakes up for the day. A person may wake with a headache caused by more benign conditions, but this article compares the brain tumor headache to the sleep apnea headache. “Both brain tumors and sleep apnea can be associated with morning headaches,” begins Joseph Krainin, MD, board certified in sleep medicine and neurology and founder of the online sleep apnea clinic Singular Sleep. “However, it’s important to keep in mind that the mechanism is different,” continues Dr. Krainin. “Brain tumors take up room inside the skull and create increased pressure. When you lie down, intracranial pressure increases naturally, but, if you’re healthy, you don’t notice it. A brain tumor also causes fluid buildup overnight that, come morning, can result in a headache. “Therefore, headaches related to brain tumors are more positional than sleep-related — it’s lying down that sets them off,” says Dr. Krainin. “There are no distinguishing features of brain tumor headaches, as they are completely dependent on the size, location and shape of the tumor. “I would agree that it would be more likely that a brain tumor headache would persist during the day, compared with a sleep apnea headache. When a person has untreated sleep apnea, their brain (and the rest of the body) is subjected to repeated incidents of subnormal oxygen levels called hypoxic events. The brain desperately needs oxygen – continuously. Imagine that for eight, even five hours overnight, this supply repeatedly dips – sometimes dozens of times per hour. No wonder many people with untreated sleep apnea awaken to a headache nearly every morning — or even in the middle of the night. It typically lingers for half an hour or so after getting out of bed. “The classic description of headaches attributable to sleep apnea are low-grade and located posteriorly (back of the head),” says Dr. Krainin. If a person has symptoms other than regular morning headaches, these will be heavily taken into account. For example, a brain tumor may also cause nausea, vomiting, increased appetite, unexplained weight loss, clumsiness, problems with gait, one-sided weakness, visual disturbances and cognitive changes. Daytime symptoms of sleep apnea consist of excessive sleepiness that usually is not remedied with naps, easily dozing off including while driving or at the supper table, a chronic feeling of tiredness or exhaustion, difficulty concentrating or a so-called brain fog, and never feeling refreshed upon waking. Absence of snoring does not rule out sleep apnea. Presence of snoring and gasping during sleep does not rule out brain tumor. Being awakened in the middle of the night at least twice every night by a full bladder is a big red flag for sleep apnea. 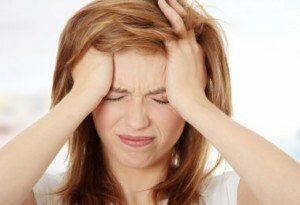 Can a 24/7 Headache for Several Months Be a Brain Tumor ? Why Isn’t a Light Sleeper Wakened by Most Sleep Apnea Events? Headaches: Brain Tumor? Sinus Problem? Stress, Tension?